Tiger Woods stood on the 11th hole at the WGC-Dell Technologies Match Play on Friday needing a kick. He was down to his opponent, Patrick Cantlay, and in danger of losing the match and missing the Round of 16, which starts on Saturday morning at Austin Country Club. "I made a big putt at No. 11 and got it rolling from there, "Woods told Golf Channel. 1th and 12th. He holed out from 82 yards for eagle at the short, par-4th 13th, and for good measure, he birdied the 14th as well to go 3 up on suddenly spinning Cantlay, who went from controlling the match and the pool to be swallowed by the tiger vortex in the span of an hour. "I thought 3 was going to be the number to half the hole [on No. 11]," Woods said. "… I was just trying to get it up there and make him earn it with a 3 of my own, and next thing you know it falls into so I'll take it." Both Cantlay and Woods needed Brandt Snedeker to lose to Aaron Wise in the other match in this pool, and Snedeker got smoked 6 and 4. That match ended before this one so Cantlay and Tiger both knew their own destiny for the remainder of the day. Tiger made couple at no. 15 and birdie at no. 16 to easily seal the deal 4 and 2 and make it to the final 16 for the first time in over a decade. He did it from tee to green, too. 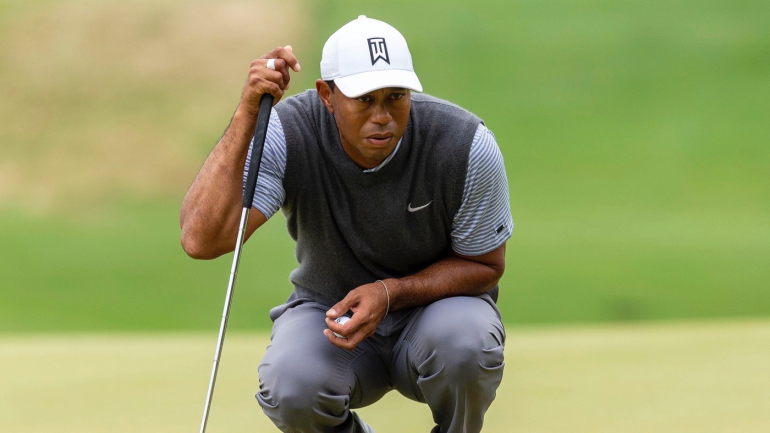 After not hitting the ball especially over the first two days, Woods ranked in the top 10 in that category on Friday, which helped him five birds and that eagle. As his reward – which is not much of a reward at all – Big Cat gets the hottest player in the world, Rory McIlroy on Saturday in the Round of 16. McIlroy, who roasted Luke List, Justin Harding and Matthew Fitzpatrick in succession, has not trailed for a single one of the 46 he's played thus far. "I was fortunate enough to have won my match, and then I needed to have two things happen," Woods said. "The fact that Aaron won his match gave me the opportunity to advance. Rory tomorrow, I'll be ready." "I just hope I had a better fight than I did in Atlanta last year," McIlroy, who got dusted in the Tour Championship by Woods last September, told Golf Channel. "It's exciting. It's exciting for the tournament. I'm sure it's going to be exciting for us. I feel good about my game. I've played well all year, and I've continued to do so this week. "It'll be exciting. It's definitely going to be one of those ones where I need to go out there and stick to my game plan and not really look at what it does until I maybe have to go to the end. " So get excited for the first Rory-Tiger one-on-one matchup as Woods in a familiar match play lockstep and McIlroy tries to strengthen his stranglehold on a claim as the best on the planet going to the first major. While whatever happens on Saturday morning, it won't mean for the overall arc heading into Augus take, it's the perfect one-off sport (and maybe every sport) calls its lifeblood.